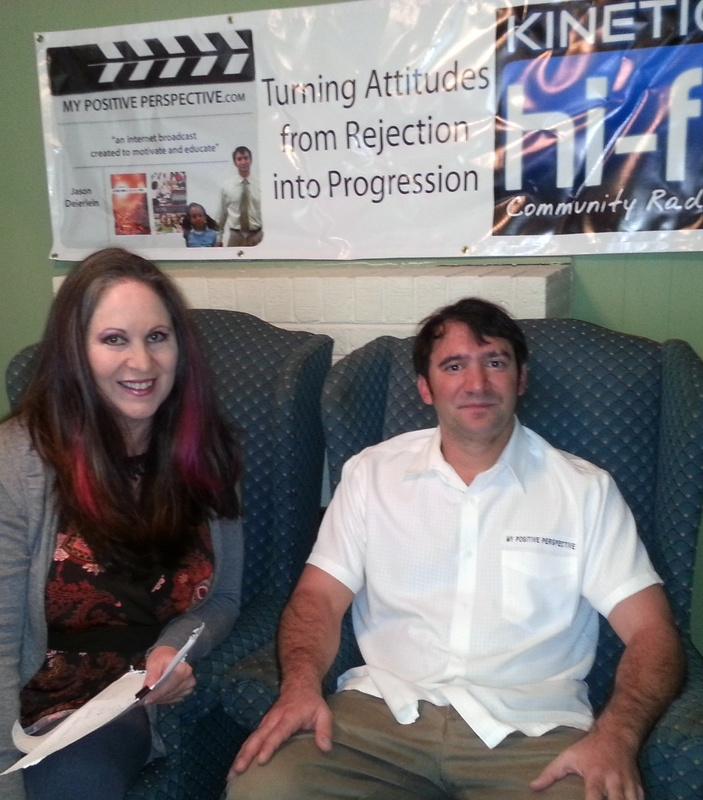 Just Before Going on “My Positive Perspective” on Saturday, Jan. 26, 2013! Jason D. and me pictured. My husband did a great job in helping with the recording! Look for it on YouTube soon. I’m back on “My Positive Perspective” This Saturday! Camille L. Key is the owner/operator of Charleston After Dark (www.CHS365.com and http://www.CharlestonRoseBall.com). For those not living in the Greater Charleston Area, she is the gorgeous powerhouse responsible for many large-scale and unique events in the area, strategic connecting, creative marketing, website development, etc. (including the Charleston, South Carolina Rose Ball). You can contact her via the sites above or directly at Camille@chs365.com. After moving from Denver, Colorado to Charleston, South Carolina, did you experience any culture shock? Not really—I had visited Charleston and Kiawah before, numerous times, and I loved the beach and laid back atmosphere. The only real adjustment was the fact that the job market seemed to only cater to F&B (food & beverage), attorneys or the medical field. Moving from Denver, where I previously owned a mortgage company and where there are tons of large tech. companies, was difficult and at one point I did return to Denver for a contracted financial position for a few months before deciding to reside in Charleston. You own and operate the marketing and advertising website CHS365—which advertises events produced via Charleston After Dark. Yet, it’s not just for those interested in Charleston’s nightlife, correct? That is correct. 🙂 I dove into the tech world when I moved here after meeting developer, Steve deGuzman, who also has a background in the real estate industry. Steve’s influence was vital to my interest in web developing as well as the development of CHS365. He’s actually even responsible for the name and I still work with him to this day, even though his family has noww relocated to Denver. CHS365 primarily is a website to advertise and market my events done under the name Charleston After Dark, as well as events for others such as the Charleston International Film Festival, Art Mag and IceBox Bar, all of which are wonderful organizations I’m grateful to be able to work with. Please tell readers a bit about how you were involved in promoting the wonderful Born to Explore TV Show. I would have to credit my past PR & Development relationship with Born to Explore to my great friend, John Barnhardt, owner of Barnfly Productions. John is a very talented filmmaker and video production company owner who is based out of Charleston. He’s been traveling the world as co-producer of Born To Explore with Richard Wiese and has been able to visit many amazing countries and really get an inside look at so many intriguing and diverse cultures. When Litton Entertainment signed them to Litton’s Weekend Adventure, which is featured on Saturday mornings on ABC Affiliates Nationwide, John called me up to bring me on board. Very cool show to be affiliated with and I couldn’t have been more excited for them when they were nominated for a Daytime Emmy Award in 2012. Have you also worked in promoting visual artists/fine artists in the Greater Charleston Area, too? If so, then please name some. Yes, I absolutely love working with artists from all over and especially love supporting the local creative community in Charleston. I tend to collaborate with tons of them, which keeps me motivated and adds so much passion and character to each and every event we produce. None of what I do would be possible without these creative people, and there are so many talented people in this town, which is the only reason I’m still here. My typical creative team consists of Travis & Jessica Teate (photographers), John Barnhardt (video production), Jason Davis (Artist & Graphic Design), Jonny Sherwood (Make-Up Artist & owner of Jonny Cosmetics) and Patrick Navarro (fab hair stylist who lives in NYC but still travels down to Charleston for clients that can’t live without him). More recently I’ve been blessed by Banks Pappas (Artist & Visual Art Production) as well as artists like Thomas Crouch who were among the group of artists brought in by The Art Mag to decorate the VIP for my New Year’s Eve 2013 Rose Ball Event. Will the Rose Ball be an annual event now? Please tell us about some of the models and disc jockeys you’ve worked with—both in and out of Charleston. Most of the time when working with models, I can say I’m fortunate to have an incredible group of friends to choose from who are local to the Charleston area. During a large scale event, like Rain or Luxe, which we produced as finale events for the previous two consecutive Charleston Fashion Weeks, the runway show is directed by someone else we bring in to help. I’ve had the pleasure of working with Charleston Fashion Week Founder and Fab Stylist, Ayoka Lucas, who styled and directed the runway show we did with Stevie Boi (designer to stars like Lady Gaga) and for the Democratic National Convention Late Night Events we produced in Charlotte. I’ve also been fortunate to have worked with Robin Lee, owner of Robin Lee Models and Talent, in the past for Rain and Luxe. Usually I’m working with the designers to help produce a runway show to showcase their clothing at one of my events around town. I’ve enjoyed working with most of them numerous times, including, but definitely not limited to, the following; Stevie Boi, Rachel Gordon – ONE Love, Emily Bargeron – Mamie Ruth, Megan Waldrep – MEW Designs, Chelsie Ravenell – Kenneth Beatrice Clothing, Hilda Herro, Pamela Cannellas – Hot Jam Miami, Beth Pilger – Pilger Designs, Scott Cannon – Scott Free Collection from LA, Betty Bangs of Miami and Siobhan Murphy – Retulled Tutus. Some of the talented DJs and Artists I’ve been fortunate to work with over the past few years include: DJ Cato K – Miami, DJ Steve Smooth – Chicago, DJ Ron Reeser – San Francisco, Percussionist Bam Bam Buddha – Chicago, DJ Arthur Bros – Charlotte, Electric Violinist Esther Anaya – Los Angeles, Singer/Songwriter Heather Friedman – Orlando, Mark Bryan – Lead Guitarist in Hootie & The Blowfish, Pianist & DJ Stephen Darby, DJ Pete Thiele of KlipArt, The Dubplates Band, Singer/Songwriter Tamsin Mac Carthy aka Circe Electro, Violinist Seth Gilliard, Mateo, Jake B and Wade Walker. Where can readers go to learn more about your upcoming events? There is actually a subscription link on my website at www.Chs365.com where you can subscribe by email to our blog, which is where we send out upcoming events information. Interview with Ellen Eldridge, Editor-in-Chief and Publisher of Target Audience Magazine! Introduction: Ellen Eldridge is the Editor-in-Chief and publisher of Target Audience Magazine, a publication which has managed to both stand out and be well-received—no small feat in this day and age when it’s much harder to get noticed due to the plethora of publications out there. In addition to her full-time job running TAM, she has two small children, two cats and a talented husband, Russell Eldridge (musician and Music Editor at Target Audience Magazine). Also, she’s penned a thought-provoking book of poetry entitled “Beyond the Eyes” which I had the pleasure of reviewing here: http://targetaudiencemagazine.com/2009/06/review-of-beyond-the-eyes/. In the interview that follows, she reveals how she manages to balance it all and where she plans on taking Target Audience Magazine in 2013. So, without further ado, it was truly an honor and great fun for me to interview her! What compelled you to found Target Audience Magazine in May of 2007? 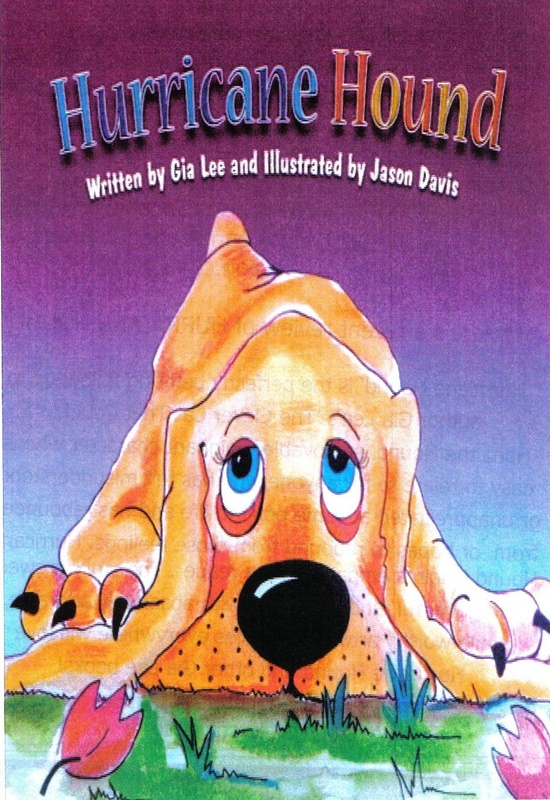 My decision to start Target Audience Magazine started out of my love of writing and the realization that my brother knew about basic web design and my sister wanted to continue a career as an illustrator. The pieces seemed to fit perfectly for this creative outlet dedicated to helping each other increase our individual skills and passions into a working model for a profitable business. The idea of family and community tied it all together because I felt it would strengthen our relationships and those who became involved as readers or contributors would experience a shift to strengthen local creative communities as well, with fine artists’ paintings or photographs that inspire musicians’ lyrics and so on. Pierre Corneille stated, “To conquer without risk is to triumph without glory.” Was starting Target Audience Magazine risky in any way? What about now—with oftentimes cutting-edge content? The riskiest aspects of Target Audience Magazine are still forthcoming because all I’ve really sunk into the business over the last five and a half years has been my increasingly precious time and personal money. I taught myself a great deal and built relationships with contributors who feel the same way I do; the contributors believe in what we do at TAM so pay hasn’t been a necessity as much as it is a goal for all involved. Of course, the goal is to make money doing what we love so I constantly evaluate my business model. With regard to content itself, I have gone back and forth about what I consider “risky” and I believe the biggest risks I’ve taken involve the way potential readers view Target Audience Magazine. I feel we’ve concentrated too much on music in general and in 2013 I want to hone in on aspects of all content that show readers ways to use the information to their benefit as artists trying to make money doing what they love, be it concert photography or fiction writing. Exposing the why a musician reaches people and how an author sells books is now thought in the forefront of my mind when writing and editing content. TAM was set up to emphasize the music scenes over the fine art and literary scenes, correct? Has this changed as the years have gone by? When I thought of starting a magazine, I wanted a single magazine that would have all the articles I wanted to read from interesting stories about human psychology to recipes for cocktails and creative nonfiction essays. I wanted to combine Parents Magazine with Rolling Stone so people like me would only need to spend money on one magazine! By trying to “target” myself I really completely got the idea of one’s “target audience” a bit skewed, so I first trimmed back to focus only on creative content and continued scaling down in the neighborhood of “creative arts,” but still didn’t want to exclude any creative entrepreneur. I want a community-focused magazine that holds reviews on deserving artists chock full of “secrets” that readers can immediately recognize and use to boost their own businesses. This is a difficult thing to explain concisely; I want to create a magazine that functions as a free public relations expert, but more than just that I want the contributors to help each other as a sort of cooperative where we really do want to grow by helping each other. This has the added benefits of helping local physical communities and economies as well as inspiring and generating new ideas for artists because a musician who does nothing but noodles on his instrument will lose the powerful feeling of finding inspiration for a song through the way a poet combines syllables rhythmically. We really can help each other grow by teaching and enlightening each other and staying open to new perspectives and healthy experiences. I hadn’t heard that quote and it makes me giggle because, if it is true, it is true because a writer—especially a poet for whom each syllable makes a distinct difference—toils and analyzes each word in a book or poem, and then revises what doesn’t fit. A writer stays committed to the craft, questioning and studying language and style even as it changes, like each poem or book is a rock tossed into a river. Those who simply want to communicate in the easiest ways possible transform words into letters and think nothing of the intricacies of grammar and punctuation. 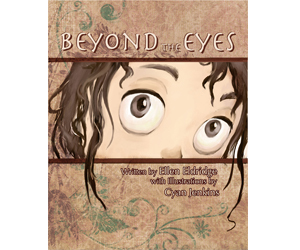 Cyan Jenkins did the artwork for “Beyond the Eyes.” I love Jenkins’ work, too. Did you choose her for the job because you knew her illustrations would be both evocative and refined at the same time? Cyan is my sister, and I initially chose her to partner with on Target Audience Magazine because she had the knowledge and technical skill to create a magazine using Adobe InDesign. She agreed to work with me in the interest of portfolio building and for that ever-elusive “family time.” Honestly, I think that she asked me to work with her on the book first because “Beyond the Eyes” was her senior art portfolio project at Ringling College of Art and Design. I agreed and was thrilled with the work that came out of her. Not only were her illustrations evocative and refined but also I felt blown away by the epiphany of what really can happen when a fine artist fleshes out her perspectives from a writer’s words. Some of the illustrations brought to light ideas I hadn’t even considered; the entire experience meant a great deal to me personally, which is why I continue the project in Target Audience Magazine with our “art/poetry” project (for which I am always looking for more contributors). Since working with Cyan on “Beyond the Eyes,” I have truly come to appreciate her talent and skill. I no longer ask her to work for “portfolio building” purposes and I almost always pay her for her work as she no longer acts as Art Director for Target Audience Magazine but as a freelance illustrator and comic. How in the world do you balance everything? You’re a mother, wife, student, publisher of Target Audience Magazine, etc.? Ha! It took me four days just to start typing answers to your emailed questions! Seriously, the answer is dedication and prioritizing; time management in the most extreme sense. My greatest skill lies in my ability to multi-task and I don’t mean just sautéing onions while reviewing the latest album, but actually using the power of critical thinking to organize my life. I can apply the way my infant son makes me feel to explaining the dynamics in a song. I can study for my mass communication and news writing classes by applying the principles to the work in Target Audience Magazine. In fact, after a summer news writing course, I chose to work with a writer to develop a style guide for contributors to TAM. The limited amount of time we each have must be divided by the choices in our life. I have a tremendous schedule but I enjoy every single piece of it. When I feel frustrated or irritable I try to switch activities until I feel rested doing whatever work needs to be done. Where would you like to take Target Audience Magazine this year? I started January 2013 with the first monthly issue of Target Audience Magazine and this year we really are focusing on the aspects of business and marketing that will help all independent professionals whether they are readers or contributors. I want all the reviews, features and interviews to show what independent artists can do in their own businesses to create better work as well as increase their profits. Where can readers go to learn more about “Beyond the Eyes” and Target Audience Magazine?